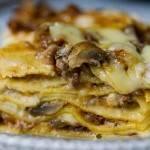 Mushroom lasagna prepared with bechamel and bolognese sauces. 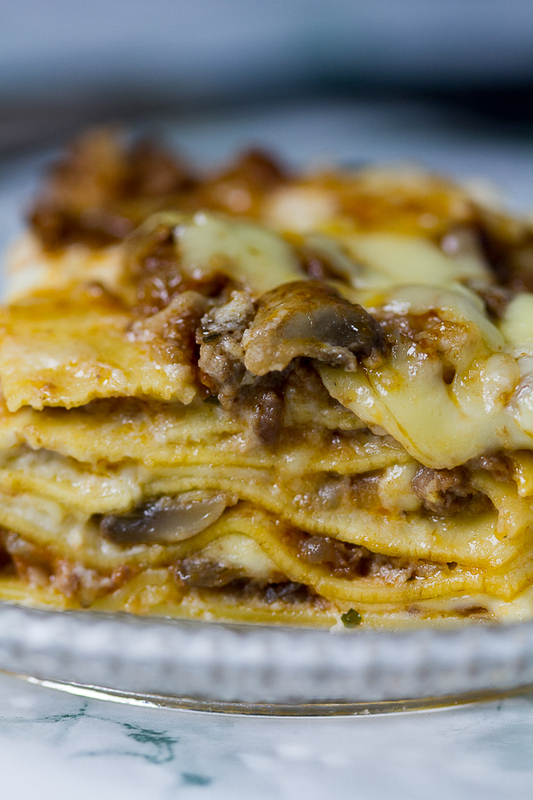 This unusual twist of two sauces combined to make the world’s most beloved casserole will invoke memories of your first lasagna: decadent layers of broad, flat pasta softened with overflowing sauces, resulting in a thousand different sparklets of flavor at once. Lasagna of today is straight outta Aleksandra’s kitchen. The first surprising thing about this lasagna are the two classically different first-rate sauces that are combined for a lavish finish. The second surprising thing is the result of the first. 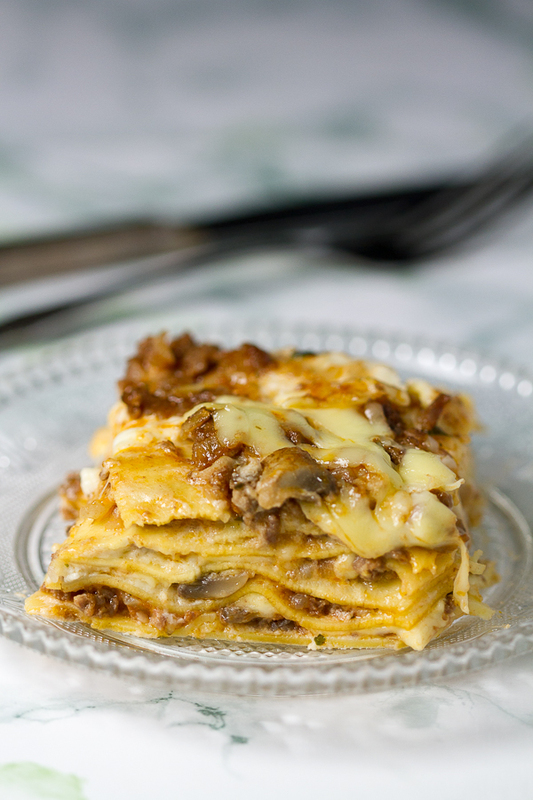 Due to the volume and richness of sauces, the actual lasagna pasta needs not be precooked. When it comes out of the oven, this lasagna is soft and moist. P.S. I forgot to take photos during the prep phase. They’ll be coming soon. We make this lasagna a lot! Like most of you, I feel as if I’ve lived several lives in this one. There were a few tenets I picked up along the way that have served me well. To celebrate, I’d like to share these 35 little wisdoms. Below is part 1. Part 2 is here. Practice Kaizen. Kaizen is the Japanese philosophy of continual improvement that rose to prominence in Japanese business sector. With Kaizen, each employee is encouraged to improve by a small amount each day. These changes add up over time, and the performance of the entire company surges. Some call Kaizen the 1% improvement. If every day we improve how we do things by 1%, think of the changes that will ensue in one year… five years… or ten. Kaizen works in personal life too. Imagine loving yourself a little bit more each day. Each day taking care of your body a bit better… Small changes over long term are profound. When Out, Never Turn Down a Chance to Hit a Bathroom. Self-explanatory. Everybody’s Got Wrinkles. A smart man once told me to look behind the obvious. Someone’s IG and FB pages are a glimpse into their life, but only a glimpse. Everyone shits. Everyone has bad days. Everyone has something that’s not going for them. No one is perfect, no matter how well put together they seem. Some of course are better at hiding this, portraying only great things. So next time you’re drooling over someone’s vacay photoshoot or job promotion, try remembering they too have to work through things. You may not see these, but everyone’s got wrinkles. Latex Gloves. Always wear them when making pindjur or ajvar. It will prevent your fingers from turning orange. It’s Better To Do 85%, Than 0% Of Something. The first thing that comes to mind even after reading Ramit’s blog for years (I even took some his courses), is, again, the importance of consistent improvement. He was talking about exercise (but it can – and should – be applied to most areas of your life), and said he’d rather see someone exercise 2-3 times a week for a year, than 5 times a week for two months. Continuity is key to building lasting habits. Dark Humor Saves The Day. Once you start laughing, you can start healing. The darker, more twisted the humor, the faster the healing. On Beating Writer’s Block. Our dad was a superb surgeon, an accomplished painter, and a prolific writer. He wrote 9 tomes on ophthalmology and about 60 medical papers in just a couple of years before his death, in addition to having a very lively social life. When I asked him where he found the time and energy to accomplish so much, he shared his method. He said to write half a page each day. And to continue writing each day. That’s 182.5 pages in one year. In two, 365. So stop BSing around, and chip it away half a page at a time. Accept Your Death. Accepting that you will die, being strongly and truly aware one day you won’t be here, will grant you gratitude for today. It will make you a better person. You will live a better life. New Age Positivity Is a Sham. It’s dangerous to brainwash yourself into disregarding your true feelings. Accepting the way you feel in the present moment and processing this on spot will do wonders more than the repetition of mantras. Sure, redirect your thoughts if they’re overly negative. But don’t beat yourself up for being in a bad mood from time to time. To do otherwise is foolish. And dangerous. No one normal thinks positively all the time. No one. Instead, find balance and negativity will have less and less space in your thoughts. At this point you’ll accept your true feelings and thoughts, and then move on. You’re not a robot. You shouldn’t be trying to reprogram your mind. Instead be gentle and accepting of yourself, and you will genuinely become more positive. Get Back to Reading. Immediately. Yes, I know. You don’t have time to read. But how much TV did you watch this week? Could two of those hours have been spent reading? Absolutely. Reading is a tool for broadening the mind. For making you into an interesting person. It’s soul food for your creativity. We all have 24 hours in a day. And once the day is finished, it’s gone forever. So while I’m all about binge watching a good show, I’m also a big proponent of infusing our mind with lots of books too. Tell Parents You Love Them. Each time you get off the phone with your parents (you are calling them regularly, right?) tell them you love them. A simple I love you mom, or I love you dad will suffice. It doesn’t matter how awkward it is. Or how silly each one of you feels. Just do it. They will die. Most likely before you. And you will hate yourself for not expressing enough love for everything they’ve done for you until this point. Save yourself years of therapy, and tell them you love them already. Travel. Travel far. Travel wide. Step out of your comfort zone. Traveling will provide a stepping stone. You will see the constructs of your own culture shift a little bit. Each time it’ll be uncomfortable, and each time you’ll be freer of expectations. And a better person for it. You’ll return home a little wiser, and feel a sense of belonging to the world. Also, creativity flourishes when you’re spending time on different soil. Find People Who Are With You When You’re Happy. An unusual one. Generally we want people who will be with us during hard times. A noble goal indeed. But an even nobler goal is to surround yourself with people who are happy for you when you’re happy too. People love drama, and they love nothing more but to be in the center of your tragedy. Tragedy is addictive and it’s human nature to feed on this. So when you find people who are there when things are great, make sure you have them stick around. Heat up oil in a large pan over medium. Add onions and simmer until crystalized. Add ground beef and simmer until no longer pink. Add mushrooms and simmer another 10 minutes. Finally, add tomato sauce, spices and herbs, simmer for final few minutes and remove off heat. Stir everything occasionally. In another pan, heat up butter on medium. Add flour and stir quickly to avoid crumbing. Add heavy cream and continue simmering. Finally, add milk. Stir the sauce continually. Remove off heat. Place 3 lasagna sheets on the bottom of a baking pan (no need to precook them). Top evenly with two to three ladles of bechamel sauce. Then, spread a couple of ladles of bolognese sauce with mushrooms over it. Finally, top generously with several handfuls of cheese. Repeat 3 more times (for the total of 4 layers). However do not top the top layer with cheese. Heat oven to 400°F. Place the pan on the middle rack and bake for 15 minutes. Take out, add the last layer of cheese on top and return to the oven for an additional 5 minutes.